2 Popular Natural Hair Styles You Should Try! You may be a Natural hair veteran and never attempted a Bantu Knot Out or a Flexi Rod Set. You could be a newbie and wanna know more about both styles, but either way, these two styles are so beautiful and lasting that you should at least give them a try. Bantu Knots can be a style all on their own or a way to curl hair while a flex rod set is a slight variation of the traditional roller set. Both are protective styles that lasts long and give great frizz-free curls. We've got a video for each style with easy instruction and yield fire results! Destiny of Destiny Taylor xo creates an amazingly simple Bantu Knot out with full instruction and in great detail. Love her hair and the style. She starts out by washing and conditioning her hair and then gently towel dries it. She detangles her hair using the wide toothed comb from the ends down to the roots, holding the hair in the middle so she doesn’t pull with the comb and stress her scalp. After that, she sections her hair into four parts and moisturizes each section properly using olive oil. When this is done, she starts the Bantu process, sectioning each section into three. She applies her styling gel to her roots and strands and carefully twists her hair into the knot. According to her, you can twist in whatever direction you want. Once she’s done twisting, she rolls the hair into a knot and tucks the end under. If the ends can’t stay put, you can choose to hold them down with a bobby pin. She does the same to the remaining sections. She lets the hair dry till the next morning and then slowly unravels the curls and styles in her favorite way. You can do the same. Mini Marley is another talented and beautiful vlogger with amazing hair. 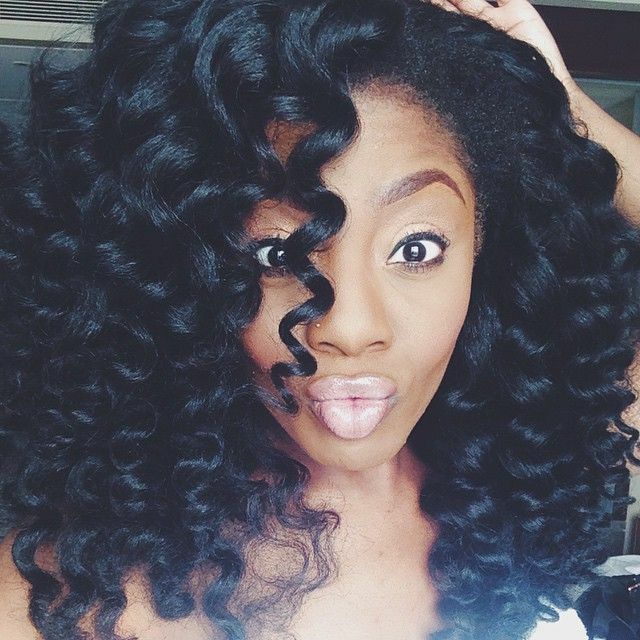 Her flexi rod set is pure gorgeousness and easy to follow with perfect results. She sections the hair and starts by wetting the ends of her hair and then rubbing the product in (she mixes the smoothie and the cream). After working on the ends, she moves up and applies the product all over the hair. To curl it, she places the flexi rod at the end of the hair and then wraps the hair around it. She places the end of the section right at the point where she bends the flexi rod to keep it secure. Once she's done with her hair, she wraps it up in a silk scarf and lets it sit overnight. By the next morning, her curls are set and all she has to do is unravel them slowly to avoid frizz. You can choose to fluff out the roots with your finger or a comb to add volume. Both styles are lovely so make sure to try one or both out and share below your resutls.